Personal care compositions containing an active selected from the group consisting of Lauryl p-Cresol Ketoxime, Bis-abolol and ginger extract, 4-(1-Phenylethyl)1,3-benzenediol, Lupin (Lupinus albus) oil & wheat (Triticum vulgare) germ oil unsaponifiables, Hydrolyzed lupin protein, Extract of L-lysine and L-arginine peptides, Oil soluble vitamin C, Evodia rutaecarpa fruit extract, Zinc pidolate and zinc PCA, Unsaponifiable fraction of olive (olea Europaea) oil, Alpha-linoleic acid, p-thymol, and combinations thereof are provided. Methods for regulating the condition of mammalian keratinous tissue by topically applying the personal care compositions are also provided. This application claims the benefit of U.S. Provisional Application No. 60/818,152, filed Jun. 30, 2006. The present invention relates to personal care compositions containing skin and/or hair care actives. Such compositions are useful for regulating the condition of mammalian keratinous tissue needing such treatments, particularly skin lightening. Applicants have discovered that personal care compositions that contain certain skin and hair care actives may be used to provide prophylactic as well as therapeutic treatments for keratinous tissue conditions, particularly skin-lightening. In accordance with one preferred embodiment of the present invention, there has now been provided a personal care composition comprising an active selected from the group consisting of Lauryl p-Cresol Ketoxime, bis-abolol and ginger extract, 4-(1-Phenylethyl)1,3-benzenediol, Lupin (Lupinus albus) oil & wheat (Triticum vulgare) germ oil unsaponifiables, Hydrolyzed lupin protein, Extract of L-lysine and L-arginine peptides, Oil soluble vitamin C, Evodia rutaecarpa fruit extract, Zinc pidolate and zinc PCA, Unsaponifiable fraction of olive (olea Europaea) oil, Alpha-linoleic acid, p-thymol, and combinations thereof, at least one additional skin and/or hair care active selected from the group consisting of sugar amines, vitamin B3, retinoids, hydroquinone, peptides, farnesol, phytosterol, dialkanoyl hydroxyproline, hexamidine, salicylic acid, N-acyl amino acid compounds, sunscreen actives, water soluble vitamins, oil soluble vitamins, hesperedin, mustard seed extract, glycyrrhizic acid, glycyrrhetinic acid, camosine, Butylated Hydroxytoluene (BHT) and Butylated Hydroxyanisole (BHA), menthyl anthranilate, cetyl pyridinium chloride, tetrahydrocurmin, vanillin or its derivatives, ergothioneine, melanostatine, sterol esters, idebenone, dehydroacetic acid, Licohalcone A, creatine, creatinine, feverfew extract, yeast extract (e.g., Pitera®), beta glucans, alpha glucans, diethylhexyl syringylidene malonate, erythritol, p-cymen-7-ol, benzyl phenylacetate, 4-(4-methoxyphenyl)butan-2-one, ethoxyquin, tannic acid, gallic acid, octadecenedioic acid, p-cymen-5-ol, methyl sulfonyl methane, an avenathramide compound, fatty acids (especially poly-unsaturated fatty acids), zinc pyrithione (ZPT), anti-fungal agents, thiol compounds (e.g., N-acetyl cysteine, glutathione, thioglycolate), other vitamins (vitamin B 12), beta-carotene, ubiquinone, amino acids, their salts, their derivatives, their precursors, and/or combinations thereof, and a dermatologically acceptable carrier. The present invention also relates to articles of commerce comprising personal care compositions disclosed herein. In accordance with one preferred embodiment, there has now been provided an article of commerce comprising a personal care composition comprising an active selected from the group consisting of Lauryl p-Cresol Ketoxime, Bis-abolol and ginger extract, 4-(1-Phenylethyl)1,3-benzenediol, Lupin (Lupinus albus) oil & wheat (Triticum vulgare) germ oil unsaponifiables, Hydrolyzed lupin protein, Extract of L-lysine and L-arginine peptides, Oil soluble vitamin C, Evodia rutaecarpa fruit extract, Zinc pidolate and zinc PCA, Unsaponifiable fraction of olive (olea Europaea) oil, Alpha-linoleic acid, p-thymol, and combinations thereof; and at least one of packaging for the personal care composition and advertisement material pertaining to the personal care composition comprising indicia and/or an image which communicates that the personal care composition can be used in conjunction with an energy delivery device for regulating the condition of mammalian keratinous tissue. The invention further relates to methods for regulating the condition of mammalian keratinous tissue wherein the methods each comprise the step of topically applying to the keratinous tissue of a mammal needing such treatment, a safe and effective amount of a personal care composition of the invention. In accordance with one preferred embodiment, there has now been provided a method comprising the steps of topically applying a personal care composition comprising an active selected from the group consisting of Lauryl p-Cresol Ketoxime, Bis-abolol and ginger extract, 4-(1-Phenylethyl)1,3-benzenediol, Lupin (Lupinus albus) oil & wheat (Triticum vulgare) germ oil unsaponifiables, Hydrolyzed lupin protein, Extract of L-lysine and L-arginine peptides, Oil soluble vitamin C, Evodia rutaecarpa fruit extract, Zinc pidolate and zinc PCA, Unsaponifiable fraction of olive (olea Europaea) oil, Alpha-linoleic acid, p-thymol, and combinations thereof to a desired area of tissue; and thereafter applying a second personal care composition comprising a sunscreen active to the desired area of tissue. In accordance with another preferred embodiment, there has now been provided a method comprising the steps of topically applying a personal care composition comprising an active selected from the group consisting of Lauryl p-Cresol Ketoxime, Bis-abolol and ginger extract, 4-(1-Phenylethyl)1,3-benzenediol, Lupin (Lupinus albus) oil & wheat (Triticum vulgare) germ oil unsaponifiables, Hydrolyzed lupin protein, Extract of L-lysine and L-arginine peptides, Oil soluble vitamin C, Evodia rutaecarpa fruit extract, Zinc pidolate and zinc PCA, Unsaponifiable fraction of olive (olea Europaea) oil, Alpha-linoleic acid, p-thymol, and combinations thereof to a desired area of tissue; and applying energy to the area of tissue via an energy delivery device. The present invention also provides methods of marketing personal care compositions for preventing, retarding, and/or treating uneven skin tone. One preferred method of marketing such compositions includes making available to a consumer a personal care composition comprising an active selected from the group consisting of Lauryl p-Cresol Ketoxime, Bis-abolol and ginger extract, 4-(1-Phenylethyl)1,3-benzenediol, Lupin (Lupinus albus) oil & wheat (Triticum vulgare) germ oil unsaponifiables, Hydrolyzed lupin protein, Extract of L-lysine and L-arginine peptides, Oil soluble vitamin C, Evodia rutaecarpa fruit extract, Zinc pidolate and zinc PCA, Unsaponifiable fraction of olive (olea Europaea) oil, Alpha-linoleic acid, p-thymol, and combinations thereof; and communicating to the consumer that the topical application of the personal care composition may improve the consumer's skin color. The manner in which the communication is conveyed to the consumer is non-limiting. By way of example only, the communication can be effected by known advertisement techniques, such as, television, internet and magazine advertisements. The communication may be a point-of-sale technique, such as, for example, a shelf and/or floor affixed communication. And the communication may take the form of indicia (text, symbols, colors, shades, figures, and the like) disposed in and/or on packaging of the personal care compositions. Methods of conducting business are also contemplated by the present invention. One preferred method includes the step of communicating to a consumer a comparison between a first personal care composition comprising an active selected from the group consisting of Lauryl p-Cresol Ketoxime, Bis-abolol and ginger extract, 4,-(1-Phenylethyl)1,3-benzenediol, Lupin (Lupinus albus) oil & wheat (Triticum vulgare) germ oil unsaponifiables, Hydrolyzed lupin protein, Extract of L-lysine and L-arginine peptides, Oil soluble vitamin C, Evodia rutaecarpa fruit extract, Zinc pidolate and zinc PCA, Unsaponifiable fraction of olive (olea Europaea) oil, Alpha-linoleic acid, p-thymol, and combinations thereof; and a second personal care composition that does not include the noted active. The comparison may relate to skin tone, skin lightening, skin whitening, pigmentation, among other parameters associated with regulating mammalian keratinous tissue conditions. The term “topical application,” as used herein, means to apply or spread the compositions of the present invention onto the surface of the keratinous tissue. The term “post-inflammatory hyperpigmentation” as used herein refers to the changes in melanin content as a response to an inflammatory event (e.g., acne, scratch, insect sting or bite, sunburn, etc. ), especially in dark skin subjects. The term “sallowness” as used herein means the pale color, yellow color, or the like condition of skin that occurs as a result of a loss of, damage to, alterations to, and/or abnormalities in skin components such that they become colored (e.g., yellow in color) due to processes such as protein glycation and accumulation of lipofuscin or in the decrease in peripheral blood flow that typically accompanies skin aging. The present invention may include actives selected from the group consisting of Lauryl p-Cresol Ketoxime, Bis-abolol and ginger extract, 4-(1-Phenylethyl)1,3-benzenediol, Lupin (Lupinus albus) oil & wheat (Triticum vulgare) germ oil unsaponifiables, Hydrolyzed lupin protein, Extract of L-lysine and L-arginine peptides, Oil soluble vitamin C, Evodia rutaecarpa fruit extract, Zinc pidolate and zinc PCA, Unsaponifiable fraction of olive (olea Europaea) oil, Alpha-linoleic acid, p-thymol, and combinations thereof. The actives of the present invention may be useful in skin lightening. Skin lightening may occur through multiple mechanisms including anti-oxidant mechanisms, trypsin inhibition, anti-inflammatory mechanisms, nitric oxide scavenging, tyrosinase inhibition, etc. Thus, compounds which have these mechanisms have the potential to lighten skin. The compositions of the present invention may include a safe and effective amount of lauryl p-cresol ketoxime. When present, the composition contains the lauryl p-cresol ketoxime in an amount of from about 0.01% to about 10%, preferably from about 0.1% to about 5%, and more preferably from about 0.5% to about 3%, by weight of the total composition. The Lauryl p-Cresol Ketoxime useful herein has been identified as inhibiting lipoxygenase and leukotriene formation, inhibiting tyrosinase, inhibiting trypsin as well as limiting the undesirable effects of inflammation (e.g., redness, swelling, and increased temperature). In vivo tests also suggest that Lauryl p-Cresol Ketoxime plays a role in blood circulation. An example of a Lauryl p-Cresol Ketoxime useful herein is RonaCare LPO and can be purchased from Rona EMD, USA. The compositions of the present invention may include a safe and effective amount of Bis-abolol and/or ginger extract. When present, the composition contains Bis-abolol and/or ginger extract in an amount of from about 0.01% to about 10%, preferably from about 0.1% to about 5%, and more preferably from about 0.5% to about 3%, by weight of the total composition. 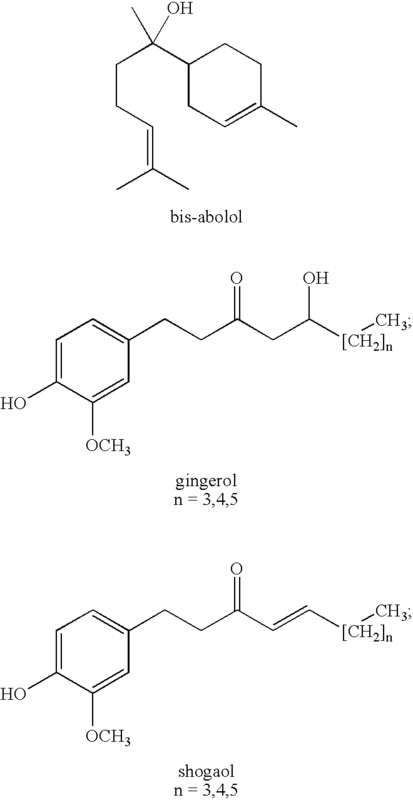 Bis-abolol and ginger extract acts as an anti-inflammatory, inhibiting both IL-1α and PGE-2. An example of a bis-abolol and ginger extract useful herein is Symrelief, which can be purchased from Symrise, Marlow, Buckinghamshire, UK. The compositions of the present invention may include a safe and effective amount of 4-(1-Phenylethyl)1,3-benzenediol. When present, the composition contains 4-(1-Phenylethyl)1,3-benzenediol in an amount of from about 0.01% to about 10%, preferably from about 0.1% to about 5%, and more preferably from about 0.5% to about 3%, by weight of the total composition. The protein tyrosinase is an enzyme involved in the conversion of the amino acid tyrosine to dihydroxyphenylalanine, which then is further converted into other intermediates and polymerized into the skin pigment melanin. Partial or complete inhibition of tyrosinase slows or stops, respectively, the formation of melanin, leading to lighter skin color (e.g., reduction in darkness of hyperpigmented spots). 4-(1-Phenylethyl)1,3-benzenediol is believed to inhibit tyrosinase, act as an anti-oxidant, and inhibit COX 1 and COX 2. 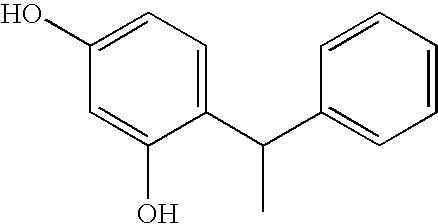 An example of a 4-(1-Phenylethyl)1,3-benzenediol useful herein is Symwhite, which can be purchased from Symrise, Marlow, Buckinghamshire, UK. The compositions of the present invention may include a safe and effective amount of Lupin (Lupinus albus) oil and/or wheat (Triticum vulgare) germ oil unsaponifiables. When present, the composition contains the lupin (Lupinus albus) oil and/or wheat (Triticum vulgare) germ oil unsaponifiables in an amount of from about 0.01% to about 10%, preferably from about 0.1% to about 5%, and more preferably from about 0.5% to about 3%, by weight of the total composition. The lupin (Lupinus albus) oil and wheat (Triticum vulgare) germ oil unsaponifiables useful herein is believed to exhibit anti lipoperoxidation activity as well as to activate glutathione reductase. An example of the lupin (Lupinus albus) oil and wheat (Triticum vulgare) germ oil unsaponifiables useful herein is Alpha Lupaline, which can be purchased from Barnet Products Coproration, Englewood Cliffs, N.J., USA. The compositions of the present invention may include a safe and effective amount of hydrolyzed lupin protein. When present, the composition contains hydrolyzed lupin protein in an amount of from about 0.01% to about 10%, preferably from about 0.05% to about 5%, and more preferably from about 0.5% to about 2%, by weight of the total composition. A hydrolyzed lupin protein useful herein is comprised of a low molecular weight white lupin peptide, with a length of from about 5 to about 6 amino acids. The peptides are enriched in glutamate, arginine, and aspartate. Matrix metallopeptidases (MMP's) are a class of protein involved in the breakdown of the extracellular matrix, including collagens. Hydrolyzed lupin protein has been identified as inhibiting MMP's 1, 9, and 3, while also functioning to activate glutathione reductase and inhibit tyrosinase. An example of hydrolyzed lupin protein useful herein is ACTIMP 1.9.3, which can be purchased from Barnet Products Coproration, Englewood Cliffs, N.J., USA. The compositions of the present invention may include a safe and effective amount of L-lysine and/or L-arginine peptides. When present, the composition contains these L-lysine and/or L-arginine peptides in an amount of from about 0.01% to about 10%, preferably from about 0.1% to about 5%, and more preferably from about 0.25% to about 1%, by weight of the total composition. The L-lysine and L-arginine peptides useful herein can be identified as a 40% solution (w/w) of a dry extract composed of L-lysine and L-arginine peptides, with a degree of polymerization included between 2 and 7, as illustrated in the figure below. The L-lysine and L-arginine peptide useful herein has been identified as blocking anti-glycation, increasing collagen production, acting as an anti-oxidant, and inhibiting tyrosinase. When present in the formulation, the L-lysine and/or L-arginine peptide useful herein requires the presence of about 3% Sepigel thickener. An example of the L-lysine and L-arginine peptide useful herein is Amadorine, which can be purchased from Barnet Products Coproration, Englewood Cliffs, N.J., USA. The compositions of the present invention may include a safe and effective amount of an oil soluble vitamin C. When present, the composition contains the oil soluble vitamin C in an amount of from about 0.01% to about 10%, preferably from about 0.05% to about 5%, and more preferably from about 0.1% to about 1%, by weight of the total composition. Oil soluble vitamin C has been identified as an anti-oxidant with anti-inflammatory properties as well as an inhibitor of trypsin. An example of an oil soluble vitamin C useful herein is BV-OSC, which can be purchased from Barnet Products Coproration, Englewood Cliffs, N.J., USA. The compositions of the present invention may include a safe and effective amount of Evodia rutaecarpa fruit extract. When present, the composition contains the Evodia rutaecarpa fruit extract in an amount of from about 0.01% to about 10%, preferably from about 0.05% to about 5%, and more preferably from about 0.1% to about 1%, by weight of the total composition. The Evodia rutaecarpa fruit extract useful herein also contains rutecarpine and dehydroevodiamine HCL, evodine, butylated hydroxytoluene, butylene glycol and 2-phenoxyethanol. The evodia rutaecarpa fruit extract useful herein has been identified as an anti-inflammatory, an anti-oxidant, and an activator of glutathione reductase. In vitro testing shows that the Evodia rutaecarpa fruit extract useful herein inhibits PGE-2 release. An example of the Evodia rutaecarpa fruit extract useful herein is Evodiox TCM, which can be purchased from the supplier Barnet Products Coproration, Englewood Cliffs, N.J., USA. The compositions of the present invention may include a safe and effective amount of zinc pidolate and/or zinc PCA. When present, the composition contains zinc pidolate and zinc PCA in an amount of from about 0.01% to about 10%, preferably from about 0.05% to about 5%, and more preferably from about 0.1% to about 1%, by weight of the total composition. The oil on the surface of skin contains a mixture of lipids, called sebum. The zinc pidolate and zinc PCA useful herein has been identified as a sebum regulator as well as an activator of glutathione reductase. An example of a zinc pidolate and zinc PCA useful herein is Zincidone 5%, which can be purchased from Barnet Products Coproration, Englewood Cliffs, N.J., USA. The compositions of the present invention may include a safe and effective amount of the unsaponifiable fraction of olive (Olea Europaea) oil. When present, the composition contains the unsaponifiable fraction of olive (Olea Europaea) oil in an amount of from about 0.01% to about 10%, preferably from about 0.05% to about 5%, and more preferably from about 0.1% to about 1%, by weight of the total composition. The unsaponifiable fraction of olive (Olea Europaea) oil useful herein has been identified as an activator of glutathione reductase as well as ab anti-oxidant with anti-inflammatory properties. An example of the unsaponifiable fraction of olive (Olea Europaea) oil useful herein is Olea-ex, which can be purchased from Barnet Products Coproration, Englewood Cliffs, N.J., USA. The compositions of the present invention may include a safe and effective amount of alpha-linoleic acid. When present, the composition contains the alpha-linoleic acid in an amount of from about 0.01% to about 10%, preferably from about 0.05% to about 5%, and more preferably from about 0.1% to about 1%, by weight of the total composition. The alpha-linoleic acid useful herein contains primarily alpha-linoleic acid (50-60%) and is isolated from the seed. The alpha-linoleic acid useful herein has been identified as an anti-inflammatory with antiseptic properties. An example of the alpha-linoleic acid useful herein is Perilla oil, which can be purchased from OilsByNature, Solon, Ohio, USA. The compositions of the present invention may include a safe and effective amount of para-thymol. When present, the composition contains para-thymol in an amount of from about 0.01% to about 10%, preferably from about 0.05% to about 5%, and more preferably from about 0.1% to about 1%, by weight of the total composition. A para-thymol has been identified as an anti-inflammatory, inhibiting PGE-2. The structure of para-thymol is shown below, and p-thymol can be purchased from Sigma-Aldrich, Milwaukee, Wis., USA. Compositions of the present invention typically comprise a safe and effective amount of at least one additional skin and/or hair care active. A representative, non-limiting list of such actives includes sugar amines, vitamin B3, retinoids, hydroquinone, peptides, farnesol, phytosterol, dialkanoyl hydroxyproline, hexamidine, salicylic acid, N-acyl amino acid compounds, sunscreen actives, water soluble vitamins, oil soluble vitamins, hesperedin, mustard seed extract, glycyrrhizic acid, glycyrrhetinic acid, carnosine, Butylated Hydroxytoluene (BHT) and Butylated Hydroxyanisole (BHA), menthyl anthranilate, cetyl pyridinium chloride, tetrahydrocurmin, vanillin or its derivatives, ergothioneine, melanostatine, sterol esters, idebenone, dehydroacetic acid, Licohalcone A, creatine, creatinine, feverfew extract, yeast extract (e.g., Pitera®), beta glucans, alpha glucans, diethylhexyl syringylidene malonate, erythritol, p-cymen-7-ol, benzyl phenylacetate, 4-(4-methoxyphenyl)butan-2-one, ethoxyquin, tannic acid, gallic acid, octadecenedioic acid, p-cymen-5-ol, methyl sulfonyl methane, avenathramide compound, fatty acids (especially poly-unsaturated fatty acids), zinc pyrithione (ZPT), anti-fungal agents, thiol compounds (e.g., N-acetyl cysteine, glutathione, thioglycolate), other vitamins (vitamin B 12), beta-carotene, ubiquinone, amino acids, their salts, their derivatives, their precursors, and/or combinations thereof. Further description of some of these additional actives is provided below. When present, the compositions of the present invention preferably contain from about 0.0001% to about 50%, more preferably from about 0.001% to about 20%, even more preferably from about 0.01% to about 10%, by weight of the composition, of the additional skin and/or hair actives. The amounts listed herein is only to be used as a guide, as the optimum amount of the additional skin and/or hair actives used in a composition will depend on the specific active selected since their potency does vary considerably. Hence, the amount of some skin and/or hair actives useful in the present invention may be outside the ranges listed herein. The skin and/or hair care actives of the present invention may be useful in skin lightening. Skin lightening may occur through multiple mechanisms including anti-oxidant mechanisms, trypsin inhibition, anti-inflammatory mechanisms, nitric oxide scavenging, tyrosinase inhibition, etc. Thus, compounds which have these mechanisms have the potential to lighten skin. Some of the additional skin and/or hair care actives that are useful herein are described in more detail below. As used herein, “sugar amine” includes isomers and tautomers of such and its salts (e.g., HCl salt) and is commercially available from Sigma Chemical Co. Examples of sugar amines that are useful herein include glucosamine, N-acetyl glucosamine, mannosamine, N-acetyl mannosamine, galactosamine, N-acetyl galactosamine, their isomers (e.g., stereoisomers), and their salts (e.g., HCl salt). Preferred for use herein are glucosamine, particularly D-glucosamine and N-acetyl glucosamine, particularly N-acetyl-D-glucosamine. The compositions of the present invention may include a safe and effective amount of a vitamin B3 compound. Vitamin B3 compounds are particularly useful for regulating skin condition as described in U.S. Pat. No. 5,939,082. Exemplary derivatives of the foregoing vitamin B3 compounds include nicotinic acid esters, including non-vasodilating esters of nicotinic acid (e.g., tocopheryl nicotinate, myristyl nicotinate). Examples of suitable vitamin B3 compounds are well known in the art and are commercially available from a number of sources (e.g., the Sigma Chemical Company, ICN Biomedicals, Inc., and Aldrich Chemical Company). A preferred vitamin B3 compound useful in the present invention is niacinamide. The compositions of this invention may contain a safe and effective amount of a retinoid. As used herein, “retinoid” includes all natural and/or synthetic analogs of Vitamin A or retinol-like compounds which possess the biological activity of Vitamin A in the skin as well as the geometric isomers and stereoisomers of these compounds. The retinoid is preferably selected from retinol, retinol esters (e.g., C2-C22 alkyl esters of retinol, including retinyl palmitate, retinyl acetate, retinyl propionate), retinal, and/or retinoic acid (including all-trans retinoic acid and/or 13-cis-retinoic acid), or mixtures thereof. More preferably the retinoid is a retinoid other than retinoic acid. The compositions of the present invention may contain a safe and effective amount of a peptide, including but not limited to, di-, tri-, tetra-, penta-, and hexa-peptides and derivatives thereof. Preferred peptides are the dipeptide camosine (beta-ala-his), the tripeptide gly-his-lys, the pentapeptide lys-thr-thr-lys-ser, lipophilic derivatives of peptides, and metal complexes of the above, e.g., copper complex of the tripeptide his-gly-gly (also known as lamin). A preferred dipeptide derivative is palmitoyl-lys-thr. A preferred commercially available tripeptide derivative-containing composition is Biopeptide CL®, which contains 100 ppm of palmitoyl-gly-his-lys and is commercially available from Sederma. A preferred commercially available pentapeptide derivative-containing composition is Matrixyl®, which contains 100 ppm of palmitoyl-lys-thr-thr-lys-ser and is commercially available from Sederma. The topical compositions of the present invention may comprise a safe and effective amount of one or more phytosterols selected from the group consisting of β-sitosterol, campesterol, brassicasterol, Δ5-avennasterol, lupenol, α-spinasterol, stigmasterol, their derivatives, analogs, and combinations thereof. As used herein, “phytosterol” includes isomers and tautomers of such and is commercially available from Aldrich Chemical Company, Sigma Chemical Company, and Cognis. The topical compositions of the present invention may comprise a safe and effective amount of one or more N-acyl amino acid compounds. The amino acid can be one of any of the amino acids known in the art. Preferably, the N-acyl amino acid compound is selected from the group consisting of N-acyl Phenylalanine, N-acyl Tyrosine, their isomers, their salts, and derivatives thereof. The amino acid can be the D or L isomer or a mixture thereof. A preferred N-acyl Amino Acid is N-undecylenoyl-L-phenylalanine. 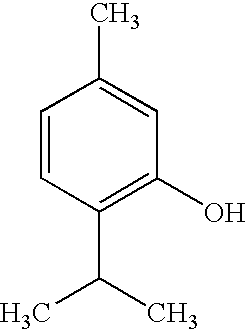 N-undecylenoyl-L-phenylalanine is commercially available under the tradename Sepiwhite® from SEPPIC. The compositions of the subject invention may optionally contain a sunscreen active. As used herein, “sunscreen active” includes both sunscreen agents and physical sunblocks. Suitable sunscreen actives may be organic or inorganic. A wide variety of conventional sunscreen actives are suitable for use herein. Sagarin, et al., at Chapter VIII, pages 189 et seq., of “Cosmetics Science and Technology” (1972), discloses numerous suitable actives. The compositions of the present invention may contain a safe and effective amount of one or more water-soluble vitamins. Examples of water-soluble vitamins include, but are not limited to, water-soluble versions of vitamin B (such as vitamin B5 and vitamin B6), vitamin B derivatives, vitamin C (such as ascorbyl glucoside), vitamin C derivatives (such as magnesium ascorbyl phosphate, sodium ascorbyl phosphate, and ascorbyl palmitate), vitamin K, vitamin K derivatives, pro-vitamins thereof, such as panthenol and mixtures thereof. The compositions of the present invention may contain a safe and effective amount of one or more oil-soluble vitamins. Examples of oil-soluble vitamins include, but are not limited to, oil-soluble versions of vitamin D, vitamin D derivatives, vitamin E (such as vitamin E acetate), vitamin E derivatives, pro-vitamins thereof, and mixtures thereof. The compositions of the present invention may include a safe and effective amount of hesperedin. Hesperedin is a flavonoid. One preferred hesperedin is glucosyl hesperedin. The compositions of the present invention may include a safe and effective amount of glycyrrhizic acid. Glycyrrhizic acid is a component of licorice extract. Glycyrrhizic acid is also known as glycyrrhizin, glycyrrhizinic acid, or glycyrrhetinic acid glycoside. The compositions of the present invention may include a safe and effective amount of glycyrrhetinic acid. Glycyrrhetinic acid is a component of licorice extract. Structurally, glycyrrhetinic acid is different from glycyrrhizic acid in that glycyrrhetinic acid does not have an attached sugar residue (glycoside). Glycyrrhetinic acid is also known as enoxolone, glycyrrhetic acid, or uralenic acid. The compositions of the present invention may include a safe and effective amount of BHT or BRA. BHA and BHT can be purchased from various suppliers, including Eastman Chemical (Kingsport, Tenn.), Alfa Chemical (Kings Point, N.Y.), and Shell Chemical Company (Houston, Tex.). The compositions of the present invention may comprise a safe and effective amount of cetyl pyridinium chloride (CPC). Alternate forms of cetyl pyridinium chloride include those in which one or two of the substitutes on the quaternary nitrogen has a carbon chain length (typically alkyl group) from about 8 to about 20, typically from about 10 to about 18 carbon atoms while the remaining substitutes (typically alkyl or benzyl group) have a lower number of carbon atoms, such as from about 1 to about 7 carbon atoms (typically methyl or ethyl groups). Dodecyl trimethyl ammonium bromide, tetradecylpyridinium chloride, domiphenbromide, N-tetradecyl-4-ethyl pyridinium chloride, dodecyl dimethyl (2-phenoxyethyl) ammonium bromide, benzyl dimethylstearyl ammonium chloride, quaternized 5-amino- 1,3-bis(2-ethyl-hexyl)-5-methyl hexahydropyrimidine, benzalkonium chloride, benzethonium chloride and methyl benzethonium chloride are exemplary of typical quaternary ammonium agents. Other compounds are bis-4-(R-amino)-1 -pyridinium alkanes as disclosed in U.S. Pat. No. 4,206,215. The compositions of the present invention may include a safe and effective amount of tetrahydrocurcumin, its esters (e.g., diacetate ester), or combinations of these. The compositions of the present invention may comprise a safe and effective amount of ergothioneine. A preferred ergothioneine is Thiotaine® which is a commercial solution of the chemical ergothioneine, commercially available from Barnet Products. The compositions of the present invention may include a safe and effective amount of octadecenedioic acid. Octadecenedioic acid is also known as C18:1 dicaroxylic acid and hexadec-8-ene-1,16-dioic acid. A preferred octodecenedioic acid can be purchased from the supplier Uniqema, New Castle, Del., USA. The topical compositions of the present invention also comprise a dermatologically acceptable carrier for the active materials. The phrase “dermatologically acceptable carrier,” as used herein, means that the carrier is suitable for topical application to the keratinous tissue, has good aesthetic properties, is compatible with the actives of the present invention and any other components, and will not cause any safety or toxicity concerns. A safe and effective amount of carrier is from about 50% to about 99.99%, preferably from about 60% to about 99.9%, more preferably from about 70% to about 98%, and even more preferably from about 80% to about 95% of the composition. Emulsions according to the present invention generally contain a solution as described above and a lipid or oil. Lipids and oils may be derived from animals, plants, or petroleum and may be natural or synthetic (i.e., man-made). Preferred emulsions also contain a humectant, such as glycerin. Emulsions will preferably further contain from about 0.1% to about 10%, more preferably from about 0.2% to about 5%, of an emulsifier, based on the weight of the composition. Emulsifiers may be nonionic, anionic or cationic. Suitable emulsifiers are disclosed in, for example, U.S. Pat. No. 3,755,560, U.S. Pat. No. 4,421,769, and “McCutcheon's Detergents and Emulsifiers,” North American Edition, pages 317-324 (1986). 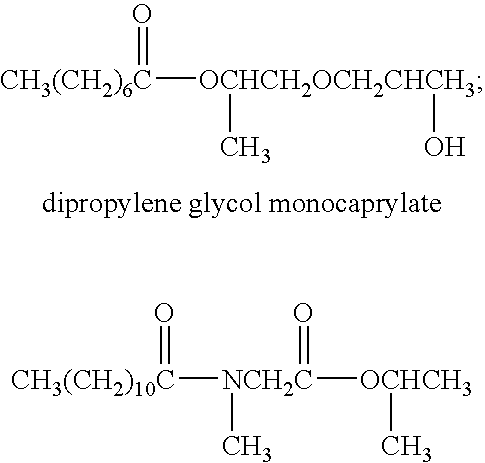 The use of dipropylene glycol monocaprylate would be a suitable solvent for use with oil soluble actives. When present, the composition contains the dipropylene glycol monocaprylate in an amount of from about 0.1% to about 20%, preferably from about 1% to about 10%, and more preferably from about 5% to about 7%, by weight of the total composition. An example of dipropylene glycol monocaprylate is Caproyl 90, which can be purchased from Gattefosse, Gennevilliers, France. The use of isopropyl lauroyl sarcosinate would also be a suitable solvent for use with oil soluble actives. When present, the composition contains the isopropyl lauroyl sarcosinate in an amount of from about 0.1% to about 20%, preferably from about 1% to about 10%, and more preferably from about 5% to about 7%, by weight of the total composition. An example of isopropyl lauroyl sarcosinate is Eldew, which can be purchased from Ajinomoto U.S.A., Paramus, N.J. The optional components, when incorporated into the composition, should be suitable for use in contact with human keratinous tissue without undue toxicity, incompatibility, instability, allergic response, and the like within the scope of sound judgment. The “CTFA Cosmetic Ingredient Handbook,” Second Edition (1992) describes a wide variety of nonlimiting cosmetic and pharmaceutical ingredients commonly used in the skin care industry, which are suitable for use in the compositions of the present invention. Examples of these ingredient classes include: abrasives, absorbents, aesthetic components such as fragrances, pigments, colorings/colorants, essential oils, anti-caking agents, antifoaming agents, binders, biological additives, buffering agents, bulking agents, chelating agents, chemical additives, colorants, cosmetic astringents, cosmetic biocides, denaturants, drug astringents, external analgesics, film formers or materials, e.g., polymers, for aiding the film-forming properties and substantivity of the composition (e.g., copolymer of eicosene and vinyl pyrrolidone), opacifying agents, pH adjusters, propellants, reducing agents, sequestrants, and thickeners. Other optional components useful in the present invention include those described in U.S. Publication No. 2004/0175347A1, including desquamation actives, such as salicylic acid and zwitterionic surfactants; soothing and/or healing agents; skin treating agents; skin sensates, astringents, etc. (e.g., clove oil, menthol, camphor, eucalyptus oil, eugenol, menthyl lactate, witch hazel distillate); anti-acne actives, such as resorcinol, sulfur, erythromycin, zinc, dehydroacetic acid; anti-wrinkle actives/anti-atrophy actives; anti-oxidants/radical scavengers, such as tocopherol; chelators, such as furildioxime and derivatives thereof; flavonoids; anti-inflammatory agents; anti-cellulite agents; tanning actives such as dihydroxyacetone; skin lightening agents; antimicrobial and antifungal actives; sunscreen actives; conditioning agents such as glycerol, urea, petrolatum, sucrose polyester, and combinations thereof; thickening agents such as carboxylic acid polymers, crosslinked polyacrylate polymers, polyacrylamide polymers, polysaccharides, gums; water-soluble vitamins; and particulate materials. Compositions of the present invention may contain a safe and effective amount of one or more of the following other actives or ingredients: fatty acids (especially poly-unsaturated fatty acids), glucosamine, zinc pyrithione (ZPT), thiol compounds (e.g., N-acetyl cysteine, glutathione, thioglycolate), other vitamins (e.g., B1, B2, B5,B6, B12, C, D, E, F, K, P), beta-carotene, ubiquinone, idebenone, amino acids, minerals (e.g., Zn, Mn, Mg, Cu, Fe, and Se), hydroxy acids (e.g., alpha-hydroxy acids, alpha-keto acids, and beta-hydroxy acids), kojic aid, arbutin, mulberry extract, exfoliation agents, anti-dandrutff agents, and the like. The topical compositions of the subject invention, including but not limited to lotions, milks, mousses, serums, sprays, aerosols, foams, sticks, pencils, gels, creams and ointments, may comprise a dermatologically acceptable emollient. Such compositions preferably contain from about 2% to about 50% of the emollient. As used herein, “emollient” refers to a material useful for the prevention or relief of dryness, as well as for the protection of the skin. A wide variety of suitable emollients are known and may be used herein. Sagarin, “Cosmetics, Science and Technology,” 2nd Edition, Vol. 1, pp. 32-43 (1972), contains numerous examples of materials suitable as an emollient. A preferred emollient is glycerin. Glycerin is preferably used in an amount of from about 0.001% to about 20%, more preferably from about 0.01% to about 15%, and even more preferably from about 0.1% to about 10% by weight of the composition. Treating keratinous tissue condition can be practiced, for example, by applying a composition in the form of a skin lotion, clear lotion, milky lotion, cream, gel, foam, ointment, paste, emulsion, spray, aerosol, conditioner, tonic, cosmetic, lipstick, foundation, nail polish, after-shave, roll-on or deodorant stick, powder, oil or the like which is intended to be left on the skin or other keratinous tissue for some aesthetic, prophylactic, therapeutic or other benefit (i.e., a “leave-on” composition). After applying the composition to the keratinous tissue (e.g., skin), it is preferably left on for a period of at least about 15 minutes, more preferably at least about 30 minutes, even more preferably at least about I hour, even more preferably for at least several hours, e.g., up to about 12 hours. Any part of the external portion of the face, hair, and/or nails can be treated, (e.g., face, lips, under-eye area, eyelids, scalp, neck, torso, arms, hands, legs, feet, fingernails, toenails, scalp hair, eyelashes, eyebrows, etc.). The composition can be dispensed from a bottle, jar, tube, sachet, pouch, container, tottle, vial, ampule, compact, etc. or can be integrally contained within a delivery form such as a wipe. The application of the present compositions may be done using the palms of the hands and/or fingers. The application may also be done with the aid of a device or implement such as a cotton ball, swab, pad, brush, eye dropper, puff, sponge, wand, wipe, foam, nonwoven substrate, mask, roll-on applicator, stick applicator, applicator pen, spray applicator, atomizer, razor, etc. The active may be contained in a rupturable pouch between two substrates. In another embodiment, the application of the topical composition is subsequent to a skin treatment such as cleansing, exfoliation, or tanning. Combinations of an oral composition and a topical composition can be packaged together as a kit. In another embodiment, the oral composition and the topical composition are not packaged together as a kit, but potential users of the regimen are informed (e.g., through 10486 25 advertisements, product labeling) that the oral and the topical compositions may be used in conjunction with one another to regulate the condition of keratinous tissue. The present invention also contemplates the delivery of energy, via a device, to keratinous tissue, either simultaneously and/or sequentially (e.g., within 10 minutes) with application of the topical compositions. The energy delivery device may deliver energy in a variety of forms, including but not limited to energy in the form of light, heat, sound (including ultrasonic waves), magnetic energy, electromagnetic energy (including radiofrequency waves and microwaves), mechanical energy (exfoliating or microdermabrasion device), and combinations thereof. The delivery of energy may be continuous, pulsed, modulated, non-modulated, and combinations thereof. In one embodiment, the energy delivery device is hand-held. Alternatively, the energy delivery device is cordless. The energy may be applied by holding a device within a single area of keratinous tissue, and subsequently moving the device to another area of tissue (or “stamping”). Alternatively, the energy may be applied as the device is continuously moved, or scanned, across the surface of the tissue. The device may be held in substantially continuous contact with the surface of the keratinous tissue, as with laser devices, or may be held at a short distance from the keratinous tissue with the energy directed toward the surface, as with flash lamps. A temperature change may be simultaneously induced in the keratinous tissue or alternatively, in a compound applied to the surface of the tissue. This temperature change is in addition to any temperature change induced by the delivered energy itself. For example, the keratinous tissue may be slightly warmed prior to delivery of energy, or alternatively, the keratinous tissue may be cooled after delivery of energy. For energy derived from ultraviolet light sources, the wavelength will generally fall within the UV-A range, from about 315 to about 400 nm (nanometer). For energy derived from visible light sources, the wavelength will generally range from about 400 nm to about 700 nm. For energy derived from infrared (IR) light sources, the wavelength will generally range from about 700 nm to about to about 3000 nm. The amount of energy delivered, or “output fluence,” may be in the range of about I J/cm2 to about 100 J/cm2, where “J” means Joules. For pulsed light sources, the pulse length may range from about 0.001 seconds to about 3 seconds, with an average pulse duration of from about 0.001 seconds to about 1 second. The surface area of keratinous tissue to be covered will vary depending on the application. These and other parameters relevant to delivery of energy depend upon the type of treatment and the type of tissue to be treated, and will appropriately be selected by one of skill in the art. The present invention also provides articles of commerce that include the personal care compositions described herein, wherein at least one of the personal care composition, packaging for the personal care composition, and advertisement material pertaining to the personal care composition comprises indicia and/or an image which communicates to a consumer that the personal care composition can be used in conjunction with an energy delivery device for regulating the condition of mammalian keratinous tissue. The present invention also provides methods of marketing personal care compositions for preventing, retarding, and/or treating uneven skin tone. One preferred method of marketing such compositions includes making available to a consumer a personal care composition described herein and communicating to the consumer that the topical application of the personal care composition may improve the consumer's skin color. The manner in which the communication is conveyed to the consumer is non-limiting. By way of example only, the communication can be effected by known advertisement techniques, such as, television, intemet, and magazine advertisements. The communication may be a point-of-sale technique, such as, for example, a shelf and/or floor affixed communication. And the communication may take the form of indicia (text, symbols, colors, shades, figures, and the like) disposed in and/or on packaging of the personal care compositions. Methods of conducting business are also contemplated by the present invention. One preferred method includes the step of communicating to a consumer a comparison between a first personal care composition comprising an active discussed herein and a second personal care composition that does not include the noted active. The comparison may relate to skin tone, skin lightening, skin whitening, pigmentation, among other parameters associated with regulating mammalian keratinous tissue conditions. All documents cited in the Background, Summary of Preferred Embodiments, and Detailed Description of Illustrative and Preferred Embodiments are, in relevant part, incorporated herein by reference; the citation of any document is not to be construed as an admission that it is prior art with respect to the present invention. 2. The personal care composition of claim 1, wherein said at least one additional skin and/or hair care active is selected from the group consisiting of sugar amines, vitamin B3, retinoids, pedtides, phytosterol, hexamidine, N-acyl amino acid compounds, sunscreen actives, water soluble vitamins, oil soluble vitamins, hesperedin, glycyrrhizic acid, glycyrrhetinic acid, Butylated Hydroxytoluene (BHT) and Butylated Hydroxyanisole (BHA), cetyl pyridinium chloride, tetrahydrocurmin, ergothioneine, and octadecenedioic acid. 3. The personal care composition of claim 2, wherein said vitamin B3 is niacinamide. 4. The personal care composition of claim 2, wherein said sugar amine comprises N-acetyl glucosamine. 5. The personal care composition of claim 2, wherein said water soluble vitamins are selected from the group consisting of ascorbyl glucoside and panthenol. 6. The personal care composition of claim 2, wherein said oil soluble vitamin is vitamin E acetate. 7. The personal care composition of claim 2, wherein said hesperedin is glucosyl hesperedin. 8. The personal care composition of claim 2, wherein said retinoid is retinyl propionate. 9. The personal care composition of claim 2, wherein said N-acyl amino acid compound is N-undecylenoyl-L-phenylalanine. 10. The personal care composition of claim 1, wherein said yeast extract is Pitera. 11. The personal care composition of claim 1, wherein said carrier comprises a solvent selected from the group consisiting of dipropylene glycol monocaprylate and isopropyl lauroyl sarcosinate. 12. The personal care composition of claim 1, further comprising from about 0.001% to about 10%, by weight, of an optional component selected from the group consisting of desquamatory actives, anti-acne actives, wrinkle repair actives, anti-oxidants, radical scavengers, chelators, flavonoids, anti-inflammatory agents, anti-cellulite agents, tanning actives, skin lightening agents, antimicrobial actives, antifungal actives, conditioning agents, thickening agents, particulate material, topical anesthetics, and combinations thereof. (b) thereafter applying a second personal care composition comprising a sunscreen active to the desired area of tissue. (c) applying energy to the area of tissue via an energy delivery device. 15. The method of claim 14, wherein step (c) is performed simultaneously, at least in part, and/or sequentially with performance of step (a). 16. The method of claim 14, wherein the energy is applied in a form selected from the group consisting of light, heat, sound, magnetic energy, electromagnetic energy, mechanical, and combinations thereof. (b) applying energy to the area of tissue via an energy delivery device. 18. The method of claim 17, wherein performances of step (a) and step (b) have at least some overlap. 19. The method of claim 17, wherein step (b) is performed within 10 minutes of performing step (a). 20. The method of claim 17, wherein the energy is applied in a form selected from the group consisting of light, heat, sound, magnetic energy, electromagnetic energy, mechanical, and combinations thereof. (b) at least one of packaging for the personal care composition and advertisement material pertaining to the personal care composition comprising indicia and/or an image which communicates that the personal care composition can be used in conjunction with an energy delivery device for regulating the condition of mammalian keratinous tissue. 22. The article of commerce according to claim 21, wherein the energy delivery device transmits energy in a form selected from the group consisting of light, heat, sound, magnetic energy, electromagnetic energy, mechanical, and combinations thereof.